Jesse Serwer of Large Up interviews Montserrat-born, New York City-based artist Jason “Gazoo” Allen. Also known as “The Black Sand Artist,” Gazoo’s work can be seen in music videos by everyone from Ryan Leslie to Mr. Vegas to Danish producer Rune RK, Alexander Wang catalogs, and Club WIP, the NYC nightspot where, until recently, he served as art director. Gazoo pursued both music and art for years after relocating to NYC with his family in the ’90s, both behind the scenes as an artist manager and producer and as an MC at venues like Greenhouse in NYC. [… He has] now focused his artistic endeavors towards bringing attention to the Eastern Caribbean island, which lost half of its population (and its once-thriving tourist industry) following the Soufriere Hills [volcanic] eruption of 1995. Gazoo’s latest showpiece is Palates, a newly-opened café he designed in Bushwick, Brooklyn as a meeting spot for the local artist community and a showcase for his increasingly in-demand woodwork. (Perhaps you’ve seen his “fly wood creations” of turntables, speaker columns and boomboxes, which have popped up everywhere from the Rocksteady Crew 25th Anniversary to Russell Simmons’ personal collection). 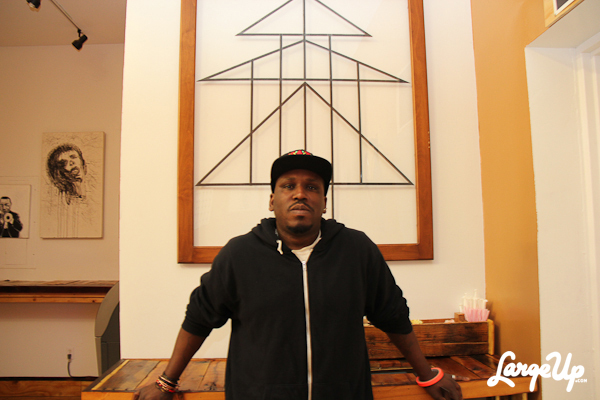 We caught up with Gazoo at Palates, the interior of which he built strictly with reclaimed wood found on the streets of Brooklyn. Jason “Gazoo” Allen: I’m Gazoo from Montserrat, a small Caribbean island with the volcano that erupted in 1995, and I’m here living in New York. I’m an artist—a visual artist, a painter, sculptor, I do carpentry, design, and street art. I’m just here spreading the Montserrat vibe throughout the world, and New York is the first place experiencing it right now on a heavy level. 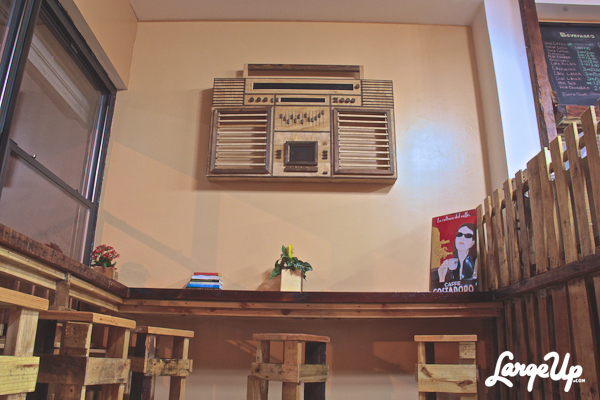 Right now we’re here at Palates, a café I built entirely from palettes you find in the street—the floors, tables, chairs, the bar shelves everything. It’s here in Bushwick, which is the art mecca of New York City right now. LU: What is your focus with your art? LU: This is sand that’s unique to Montserrat because of the eruption? Gazoo: The sand has been black for however long the island has been there, from the volcano and its whole makeup. People always say you have to know where you’re from in order to know where you’re going, so I represent Montserrat with my art, and let people know about where I’m from. Then to represent Arrow, the king of soca, who died a few years ago from brain cancer—he’s the one that sings [the original] “Hot, Hot, Hot.” He’s the person [who] brought Montserrat to a lot of people’s attention, and also Air Studios where the Beatles, The Police and Stevie Wonder recorded back in the ’70s. LU: Even though we’re in inner NYC, the aesthetic almost feels like a beachside rum bar in the Caribbean. Gazoo: In the Caribbean you have shacks that people just put together with a couple pieces of galvanize, and some wood and that could be a nice little corner rum bar. When I was building it, I was getting that feeling but it’s adding a little more elegance. I definitely want to bring this idea of using palettes to different places of the world and let people know that this material is very durable and lasts forever. […] LU: Before you focused on art you were doing music? Gazoo: Before I put 100% into art, my full one hundred was in music. I was doing artist development and managing, producing and [making] a few songs myself. I went back home to Montserrat because I was going through a bunch of stuff here in New York. And I realized that I need to do what everybody on the island […] knew me for doing. My whole family said you’re into this music thing but you need to be working on your art because you always wanted that as a kid. I said when I get back to New York that’s what I’m gonna do, I’m gonna put down the music and just push art. I [had] always said when I go back home I’m gonna bring sand back with me in a bottle to show everybody what the sand in my country look[s] like, and that time I brought the sand back with me. [… My]first piece with the sand was a stick-figure man chasing a stick-figure girl. It was black and white but had this powerful vibe and energy to it, how it shines at different angles. I started doing full portraits and finding different ways to shade with the sand. In two years, I probably made between 75 and 100 sand-art pieces. Now I do them big. I started on 4×6 greeting card-size paper and now my biggest piece is on a 4×6 foot canvas. The sand stuff is very close to me—it’s hard for me to even leave a piece somewhere without it being covered. The sand-art stuff is like my baby, it’s special. LU: Besides for the carpentry, this place is going to be a showcase for art as well? Gazoo: That’s another reason I’m involved with this cafe in Bushwick because I just want to have another outlet to show my work, and have my friends show their art as well. Every month or two months I’ll change up the art on the walls so when people come in and get a coffee or sandwich, they can enjoy the art. The full, original article is at http://www.largeup.com/2014/01/08/black-sand-montserrat-gazoo. 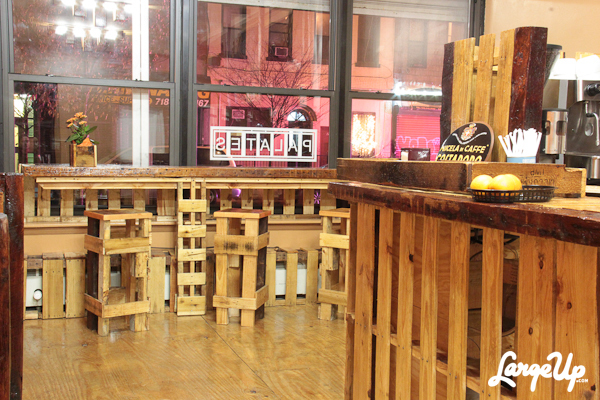 Palates café is located at 251 Wilson Ave (between Greene Ave & Harman Str), Brooklyn, NY 11237. Jason “Gazoo” Allen’s website is http://www.blacksandartgallery.com.